Cameo cards are cards where a player appears on the card of another player. However, cameo cards are not team cards or multi-player cards. Seems simple enough, but there are different levels of cameo collecting. 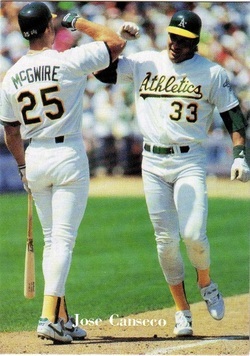 At this level the collector only collects standard cameo cards where the player is easily identified, like this Mark McGwire on the Jose Canseco card. This levels steps it up and looks for cameo cards where the player is far in the background and often blurry. The player is not easily identifiable, but looking at the uniform, position, or other characteristics, the player can be identified with reasonable certainly like this Ryne Sandberg on the Tim Stoddard card. The collector with the cameo fetish tries to identify players by individual body parts like arms or legs. 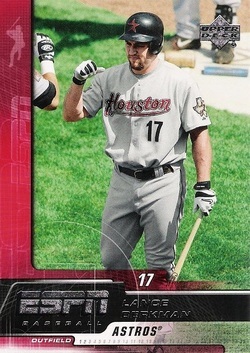 In this example, Jeff Bagwell’s feet may or may not appear in the upper-right corner of this Lance Berkman card. Evidence for: Bagwell would be near the on deck circle waiting for Berkman and he wore his pants baggy. Evidence against: you can’t see above the knee. As “This is Spinal Tap” fans will recognize, this is taking cameo collecting to “11”. This type of cameo collecting does not even bother with a picture or body part and simply looks for any card or collectible where the player’s name is mentioned. Experimental medications may be able to help with this affliction in the future.